//]]> ! ★Nail Art Couture★ ! 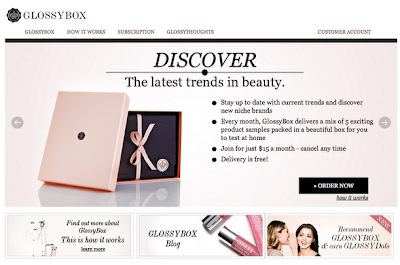 : New Box in Town: Welcome Glossybox! New Box in Town: Welcome Glossybox! Happy belated new year! I apologize for my lack of blog posts lately. I am currently back in my hometown and my mother's nail polish collection is absolutely pitiful so that is why I haven't done any nail art. I will soon when I get back to Toronto I promise! Anyways, it looks like Topbox, Loose Button, and Glymm have a new competitor and they are Europe based Glossybox! With all these subscription services, there has to be at least one feature that makes each of these services stand out among the other. To me, what makes Topbox unique is their great referral program and their focus to partner with high-end brands. For Loose Button, I believe it is their huge network of brand partners, so it is always a surprise to see what is in each month's box. As for Glymm, they have their online beauty boutique and loyalty points program. So what makes Glossybox different? According to their website, "Glossybox will always have 5 deluxe samples, helpful info, and a 6th surprise item could show up in your box at anytime." Whereas Glymm and Luxebox will range from 4 to 5 products with a bonus item here and there, and Topbox only guarantee 4 items every time. But as a brand, from what I have read, Glossybox is definitely the most established and the only beauty subscription that has actually expanded internationally. The beauty subscription service is in Germany, United Kingdom, South Korea, Brazil, Netherlands and now Canada. They are also expected to expand to United States, Switzerland, Austria, and France as well. Also their UK based service has a Glossybox for Men, which I hope is available to their international counterparts in the near future. They also have a points program called "GlossyDots", which I think is totally cute term. When you refer a friend and they subscribe, you can earn 200 Glossydots. Also when you give feedback, that is also another way to earn Glossydots (from what I gather). For every 1000 Glossydots, you can redeem a free Glossybox. When you do the math, if you get 5 of your friends to join then you get a box free! Just a recap, Topbox and Glymm are $10 plus tax, and Luxe box is $12 plus tax. Of course they all come with free shipping and handling. Glossybox is $15 including tax, shipping, and handling, so that would make Glossybox the most expensive out of all the beauty subscription services. But I'm sure their product offerings will justify their premium pricing. Besides it's only about $1.40 more than Luxebox, so it's not too bad. From watching international unboxing videos, the glossybox looks huge! Possibly to make room for plenty of full size products I hope. I'm definitely looking forward to my February Glossybox! If you're interested in signing up or browsing their website for more information, then please click here!